Serial, Parallel, USB, Ethernet and IDN cables for Point of Sale printers. 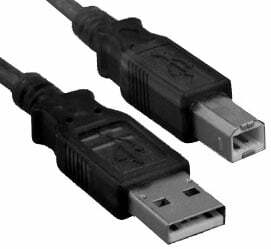 6 foot Type A to Type B USB cable. Connects a USB interface printer to a USB port on computer. 6 foot DB-25 male to Centronics 36 male parallel Printer Cable. Allows powering of Epson printer using Power Over Ethernet (POE) cabling. or 8-pin RJ-45 to RJ-12 ends. Changes a DB9 Serial Connection to a Standard USB Connection. Allows you to connect a serial printer (through a serial printer cable) to a computer without an available serial port.